The Edward Hines, Jr. VA Hospital, located west of Chicago, IL, is a 147-acre campus that provides a safe and supportive environment for America’s veterans. It is home to a variety of facilities for our servicemen and women, including America’s first Blind Rehabilitation Center (BRC). Built in 2005, this unique place helps develop the skills and attitudes needed for dealing with varying degrees of vision loss. Today, the Hines BRC is a 34-bed in-patient facility that receives applicants from over 50 VA hospitals in 14 Midwest states. It includes courses in orientation and mobility, living skills and communications, visual skills, manual skills and access technology. As an essential central facility that serves thousands of people per year, it’s important that the Hines provides a safe and welcoming space for patients to learn to live with vision loss. When the facility was built in 2005, it included LVT in high-traffic areas along with other floorcovering materials throughout additional spaces. Unfortunately, environmental challenges during installation combined with age and condition changes led to loose and buckled tiles in corridors and public spaces. 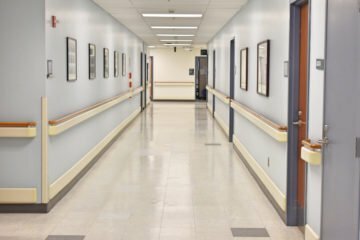 The problem first appeared in 2010 and became a hazard for blind and vision impaired patients, visitors and staff, eventually leading to the need to mitigate and replace the flooring. In-house measures were used to temporarily secure the tiles to minimize any tripping hazards for patients and other occupants. The Department of Veterans Affairs (VA) directive regarding blind centers requires them to provide training to veterans within 60 days of application. In order to meet this requirement, the Hines BRC was required to maintain 100% operational during any potential renovation work. 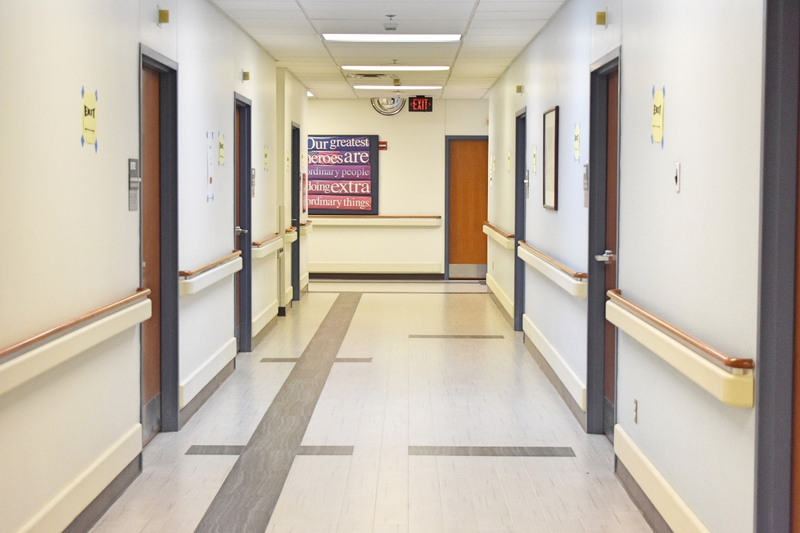 In order to minimize bed closure and facilitate a rotation of patients, installing the new floor would prove to be a challenging, multi-phase process. 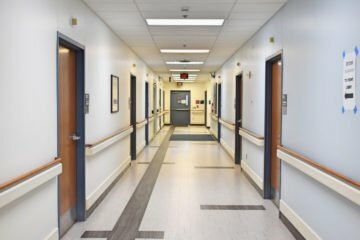 With that in mind, administrators and the hospital’s in-house interior designer set out on an ambitious plan to transform the space while limiting closures to no more than six beds at a time. This included hiring INSTALL Contractor NuVeterans Construction Services, Inc. to complete the installation process. A Service Disabled Veteran Owned Small Business (SDVOSB), the contractor played an important role in keeping patients safe and rectifying the combination of moisture, material and installation problems that led to the initial flooring challenges. “We were dealing with a facility that not only looked bad, but was unsafe,” said Denise Van Koevering, chief of the Hines BRC. “This came to a head in 2017 when our team was dealing with tile after tile that was either coming loose, buckling or delaminating. It was a frustrating situation for a floor that was installed a decade prior,” she added. Mary Tucker, an in-house Interior Designer from Hines Engineering Services, became involved as the COR and Project Manager. Together, Tucker and Van Koevering conducted market research on potential solutions. “Since we could only shut down a maximum of six rooms at a time, we wanted to do our due diligence in finding the best solution for transforming the space,” said Tucker. “We also needed to create something special in our design and elevate the facility to a new level of sophistication by creating wayfinding that our patients could feel with their long canes,” she included. Tucker met with Van Koevering several times to observe how the patients moved through the space. This included the staff who train them on their long canes and teach them how to navigate the world through constant contact and two-point touch. Due to overarching VA standards, the design and specification process was somewhat limited. The replacement flooring could not include a shiny surface and needed to be a no-wax product due to glare, reflection and slip resistance. They also couldn’t specify linoleum or ceramic tile, which narrowed them down to luxury vinyl tile. Even with LVT the specified product had to be a specific thickness to be able to seamlessly transition from LVT to existing VCT that was found in patient rooms (they were not able to use transition strips at the threshold of patient room doors as they are a trip hazard). The final product also needed light color options along with a very dark textured option that had enough texture to feel with a long stick but not too much to become a trip hazard. When considering the other daily demands of the space, including service dogs that could scratch or stain the floor, heavy rolling loads from medical carts and equipment, and heavy foot traffic, they were further limited to a handful of manufacturers. “All of the physical demands dictated the material selection process,” said Tucker. “However, there were specific design needs as well. It needed to contrast for vision impaired patients but not be too contrasting that it looked gaudy or disjointed,” she added. The team also needed materials that would pass the tap and sweep test of a long cane and help with wayfinding. 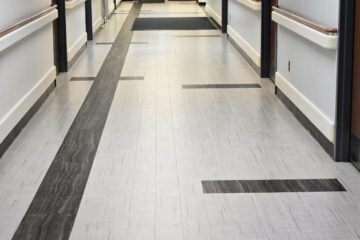 Patients needed to be able to feel a difference between the flooring material without it being too obvious. 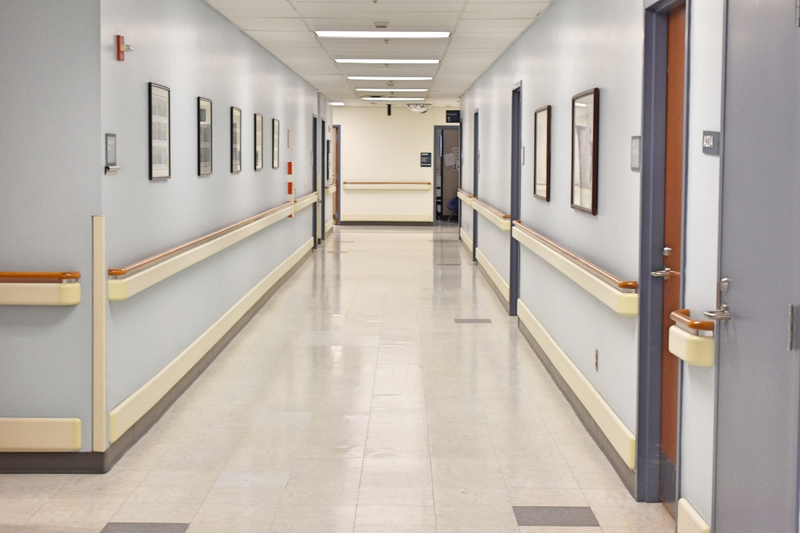 For example, a long strip of textured flooring perpendicular to a door or opening signifies a patient room. A textured square is a sign for non-patient rooms. A long strip or band that runs parallel to a door signifies an elevator or exit. 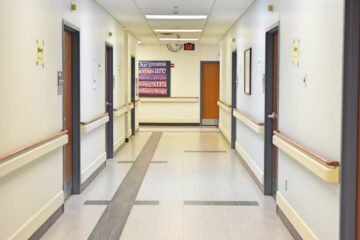 These designs do double duty, as they help the fire department look for patient rooms in smoky or hazardous conditions where only the floor is visible. 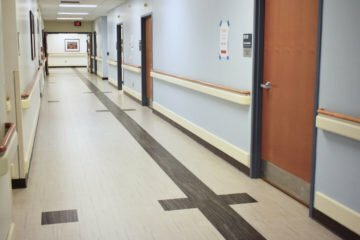 With a design in place for 13,000 square-feet of new flooring in corridors and public spaces throughout the facility, the job went out to bid through the VA GLAC. Since May 2015, the VA has adopted INSTALL certification standards or equal into its Section 09 68 00 Carpeting, Section 09 65 19 Resilient Tile Flooring and Section 09 68 21 Athletic Carpeting, for contacting purposes. Because the new standards require a general contractor to select an INSTALL-certified contractor into their specification, no matter who the lowest bidder is, they’re guaranteed to be qualified. This means the job will be done right. Requiring INSTALL standards also means that the contractor is reliable with a proven track record and the installers on the project will be highly trained and carefully tested to perform the work needed. While the Hines VA BRC project attracted several bids, it was awarded to INSTALL Contractor NuVeterans Construction Services. A full-service commercial contractor for the greater Chicagoland area, NuVeterans has completed a wide variety of local commercial tenant improvement (TI) projects, restorations and structural repairs. It is a licensed Chicago commercial contractor and does custom construction of office buildings, multi-family structures, and retail shops in various configurations. The company also happens to be a Service-Disabled Veteran-Owned Small Business (SDVOSB), making this project especially important to President and Owner Nick Anos and his team of installation professionals. “One of our biggest challenges with the project was the phased installation approach in a fully operational healthcare facility for vision impaired veterans,” said Anos. 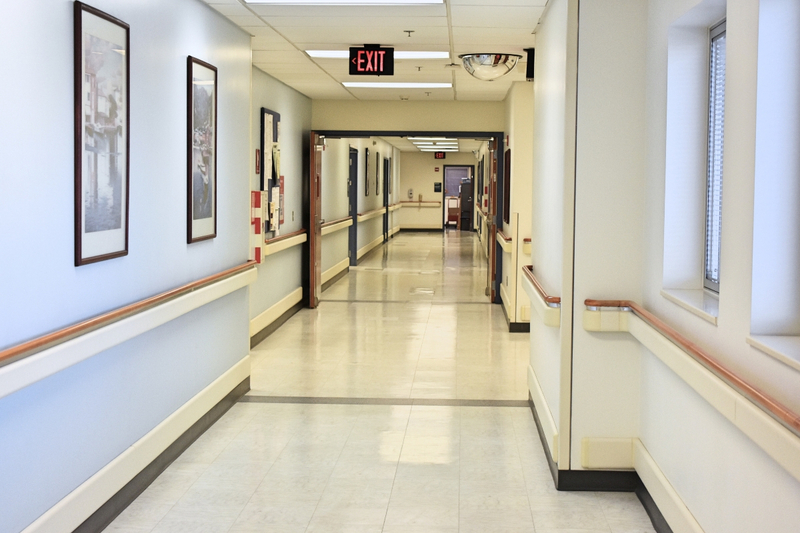 “Not only were infection control barriers and other safety systems a major concern, we needed to get to the bottom of the flooring failure from the installation in 2005,” he explained. Throughout each phase, Anos and his team needed to address moisture barrier and mitigation issues to improve conditions. After removing each tile, the installation ground and shot-blasted the concrete to remove any contaminants. They then used a Schönox brand moisture mitigation system to prepare the surface for primer and texturizing. Before the LVT was installed, the new subfloor received a skim coat of Schönox SL. This cement-based rapid drying smoothing and finishing compound provides a smooth finish on various substrates, making it ideal for this fast-moving project. Another challenge was creating an infection barrier that could be seen by vision-impaired patients who were not fully blind. The infection barrier needed to keep dust, allergens and other debris out of occupied spaces. “A black plastic barrier was implemented as it provided enough contrast for many of the patients in the facility to see,” said Anos. 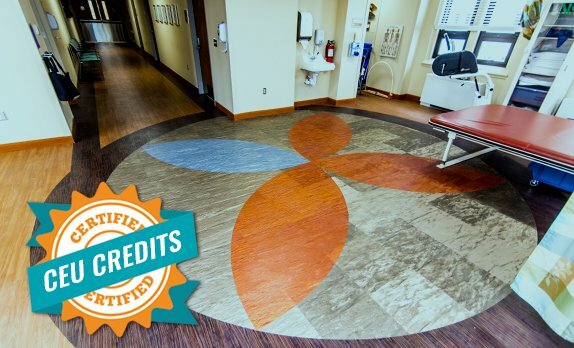 With roughly 13,000 square-feet of flooring and 21 phases, the Hines installation was challenging, but thanks to certified training from INSTALL, the NuVeterans’ team was able to quickly and efficiently complete the project with minimal disruption to patients, staff and visitors. Specific education in moisture mitigation and substrate preparation helped them provide the facility with a floor that will last for decades. More importantly, the patients who now call the Hines VA BRC home know they have a floor that’s specifically designed for them.